I’m so excited! Or should I say sew excited? 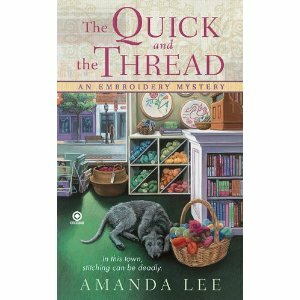 Amanda Lee is here today, with her latest release, The Quick and the Thread, a cozy, little embroidery mystery. Amanda, I know your other books are in the cozy mystery genre, so why use a pen name this time around? The publisher requested a pen name. Did you have concerns about marketing a new brand/name? What did you learn not to do? Don’t set up a separate website. You’ll want your marketing efforts to feed off each other and funnel into one central site. I suggest not creating a separate identity for your pen name. While I’ve dressed as a character for a reading before, I would feel ridiculous trying to maintain an assumed persona. For instance, the series written as Amanda Lee is set in Oregon. If I tried to pass Amanda Lee off as an Oregon native, someone would have to talk to me for mere seconds to realize I’m from the South! Don’t choose a name that has already been used. Prior to settling on the name Amanda Lee, I should have performed an extensive Amazon and Internet search for the name. There is a suspense writer who once used the name, and I had trouble persuading Amazon that I-not she-wrote The Quick and the Thread. Do you write more than one mystery at a time? And if so, how hard is it to keep those voices in your head straight? Or keep all those writing threads from getting tangled up? It’s really hard sometimes, especially when I’m doing edits on one book while finishing another. I find myself writing “Brea Ridge” (the location for the Daphne Martin cake decorating series) rather than “Tallulah Falls” or “Marcy” rather than “Daphne.” I’ve been known to keep a cheat sheet by my side to help me remember which details go with which series. So, Amanda, what’s your best advice for a writer who wants to follow different threads? Keep a cheat sheet. Seriously. That way, you won’t wind up giving secondary characters in both series the same last names, for example. Or first names. For some reason, the name “Todd” wound up in both my series! Todd, huh? There’s probably a cozy, little “name” mystery there! Thanks to Amanda Lee for her brilliant What Not To Do advice. And now I have a little What To Do advice for you. You might want to check out the book trailer for The Quick and the Thread on her website. This visual marketing tool will be a must-do when your book comes out, and Amanda’s trailer is short, sassy, and sew fun. Bet you’re dying to get your hands on The Quick and the Thread, too! So I’d advise you (I know. I’m just full of advice today!) to leave a comment and keep your fingers crossed that you’re the random winner. And please leave an email (in secret password terms) so I can get in touch with you. But in case you don’t win, zip over here to Amanda’s website (Yes, I know the name is not Amanda Lee. Haven’t we just spent the last few minutes discussing that pen name, y’all?). You’ll find out where The Quick and the Thread is available. Or you can check out her blog for other stops along the book tour route to find another chance to win this cozy mystery. Don’t worry about missed stitches. Normally, no one will ever know you made a mistake. Except you. And if the piece turns out well, it won’t matter. Take a chance on something new. You might be surprised at how easy it is. I got a ribbon embroidery kit. I’d never done ribbon embroidery, and I was expecting it to be really hard. It wasn’t, and I really enjoyed it. Gayle-I'd love to have that Pooh piece (Southern style)!Glad y'all stopped by and good luck!And Margo, I can see why you keep trying to win this book-it's such a fun read (and Gayle cracks ME up)! Love the cheat sheet idea! And the "Todd" mystery. Doesn't it seems odd the publisher required the pen name – seems like it would all be simpler with one name, and many authors these days cross genre lines with no trouble. Good advice on the cheat sheet. Every once in a while I'll notice a name repeating in a series and wonder if they're related to a previous character or not. Sounds like a fun book! This book looks like a good read. I love the advice "Amanda Lee" has given. Looking forward to taking a peek, especially since I love to embroider! Thanks for this great interview, Miss Cathy C.! You had me in "stitches"! :oWould love to win this book and I used to love to do embroidery, especially the old printed cross stitch. You know my math brain, or lack of one…I can't do counted cross stitch…too many numbers!